My husband received this book for Christmas but I got to it first. I'm looking forward to his reading it because I think he will enjoy it -- as would anyone, I can imagine. However, just because I can imagine it doesn't mean that it is so. This story was written for a proposed series to be published in the Atlantic Monthly. Twain was hoping to write a skeleton plot and pass it around to various authors to have them contribute to the tale. This did not happen though and Twain wrote the entire piece himself. I'm so glad. Critics seem to find this book a bit too hyped up. It was (finally) published in 2001as a sort of "lost manuscript" and I'm sure that anyone waiting to devour the book could feel the need to be let down. I however, in 2008, was not the least bit let down! I found it humorous, enjoyable, entertaining and too short! Since it was meant to be published as a series, it rather quickly pulls its punches and yet at the same time pokes fun of things that you least expect. Twain does a good job of making fun of people in a subtle way that probably comes across as too arrogant at times but in its proper place is really very funny. I frequently found myself laughing outloud. What I found boring and dull was Roy Blount Jr.'s review and explanation of the story which takes up half the binding space. His review is about as long as the book itself and over a million times more boring. I read it thinking that it would be insightful but discovered more focus on Twain's politics than the purpose of the story itself. I see no need to read it, really. You could easily skip it and be just as well off. If anything, read Blount's explanation of the story before the story. Save the best for last. All in all, this little book was lots of fun and if you ever find yourself with time to spare and a copy in your hand -- I'm sure that you won't easily put it down until you've finished it. This is a fun read. 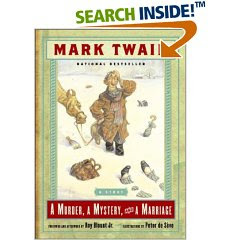 Having never read a Twain I didn't like I was eager to read this when Christopher gave it to me several Christmases ago...I was not disappointed. I totally agree with your assessment of the introduction (a waste of perfectly good ink and I can't imagine Twain would approve either). The only reason I could figure for this lengthy a forward is that the actually was so small =( that someone thought it needed a filler. Hope Jonathan finds enjoyment in it. I think Twain would have made a great comedian in our day. This book sounds wonderful. Thank you.